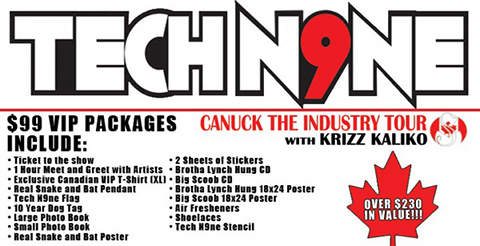 Tech N9ne is about to take Canada by storm and Canuck the Industry! Due to such high demand, there has been a recent expansion of VIPs available in certain cities, so if you thought they were all sold out (which they were in some cities), think again! Check out the cities below that have expanded available spots open for the VIP! Click here to order yours today!